Not long ago, most people had not heard of a gluten-free lifestyle. In fact, many probably didn’t know what gluten was. Many suffered with undiagnosed celiac disease, left ill and without answers. With all of this focus on gluten-free lifestyles, it’s no surprise that the restaurant industry has taken notice. Many restaurants are beginning to recognize the potential for attracting a whole new market. While that is fantastic news for those with celiac disease, it also raises the need for awareness of other issues—namely, that going gluten free isn’t a simple feat. Restaurants that wish to add gluten-free items to their menu have much to consider, and dietitians may have new educational opportunities as a result. The Outback Steakhouse in Roswell, Ga., is one location that’s got gluten-free dining down pat, but it wasn’t always that way. Assistant manager Julie Arens says that when she first started working there, she discovered that the restaurant offered a gluten-free menu and, out of curiosity, she asked what that meant. “There wasn’t a lot of information about what this menu was or that we even offered it,” she recalls. “But I found someone who could explain it to me.” For Arens, the explanation set off an epiphany, and she suddenly realized why she had been getting sick for years. “I like to say that Outback saved my life,” she says. After she was diagnosed with celiac disease, Arens became determined to help the restaurant produce the necessary changes to make their gluten-free offerings safe for diners. “Here I worked for this company that wanted to do things right—evidenced by the fact that they had created a gluten-free menu as many as 10 years ago—but they just weren’t doing it the right way,” she says. With the success that the Roswell location was having, Propp and Arens wanted to help Outback make some necessary changes on a national level. The answer was a training video, which they helped create and is now distributed to Outback restaurants nationwide. In the video, Arens speaks about what it means to have celiac disease, what gluten is, and what it feels like for a person who has to dine gluten free. Propp focuses largely on some key training points that would make the kitchen safer, such as avoiding cross-contamination. The video doesn’t get into all the “extras” that the Roswell location offers, such as the gluten-free Bloomin’ Onion, but instead takes Outback’s already-existing gluten-free menu and explains how it can be put into better practice. As the general public becomes more educated about the gluten-free movement and more people receive a celiac diagnosis, the demand for gluten-free dining is sure to grow alongside the need for education. This presents great opportunities for dietitians to offer their services to local restaurants and means that all RDs—whether or not they specialize in celiac disease—must stay up-to-date on the research. 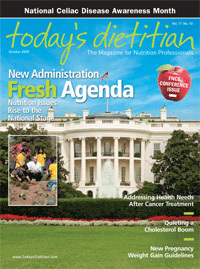 There are a multitude of resources available to dietitians. Thompson suggests: “It is very important for dietitians who counsel persons with celiac disease to familiarize themselves with ADA’s [the American Dietetic Association’s] evidence-based nutrition practice guidelines for celiac disease. These guidelines are available free of charge to members of ADA and are available at www.adaevidencelibrary.com.” Also helpful for those who need guidance on dining out is the Gluten-Free Restaurant Awareness Program, run by the Gluten Intolerance Group of North America and online at www.glutenfreerestaurants.org. This organization helps facilitate a relationship between individuals with celiac disease (and other forms of gluten intolerance) and restaurants. While some may argue that it’s impossible for restaurants to offer both gluten-containing and gluten-free items on the same menu—that the issues of cross-contamination and staff knowledge make it too difficult to accomplish—Roswell’s Outback success story proves that with the right effort and much guidance, restaurants can do it. “I’m happy to say that while we may have had some small errors here and there as we got more accustomed to doing this, we have never had a major mistake that’s made someone sick,” reports Propp. In addition, Pickell adds that many patients live in a household with people who do not have celiac disease and are able to make it work. “The difference is that the people in the home are properly trained,” she says. “At home, we are used to doing food preparation a certain way, and it becomes a habit to follow certain guidelines and avoid cross-contamination.” With the proper guidance from knowledgeable dietitians, many believe it’s possible for restaurants to reach this point as well.